The Reginald L. Hart Class of 1879 Photograph Album was donated to the University Archives by Lydia Freeman in July 2012 (Accession #: 2012: 034). The Photograph Album is in it’s original order. Reginald Lawrence Hart was born on November 24, 1858. He entered the University of Pennsylvania in 1875 as part of the Class of 1879. While attending the University he was a member of the winning crew team in the Schuylkill Navy regatta and in the Childs’ Cup race in 1879. Hart left during his senior year before graduating. He went on to become the manager of the Metropolitan Department of the Equitable Life Assurance Society, and married Elizabeth Whiteley. Hart lived in Wayne, PA where he died on March 5, 1917. The Reginald Lawrence Hart Class of 1879 Photograph Album contains images of members of the Class of 1879, the faculty, and a few miscellaneous images – most notably related to athletes from the time period. The album has been kept in it’s original order, with the identification of individuals penciled in under their photographs based on signatures on the back of images. Photocopies have been made of more extensive notes found on the backs of a few photographs and are in a separate folder. 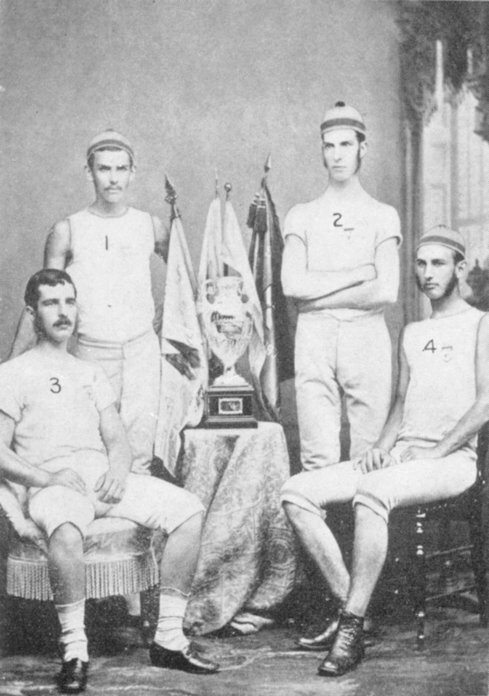 The oversized image of the University of Pennsylvania crew team of 1882 has been placed with UPX 12 OS32. Wm. M Stewart, Jr. Phila. Orsman and Pres. Athletic Assoc. John S. Elliott, Savanna, Ga.
Saunders Lewis, Jr. Treas of A. A.
Unites States Capital Building, Washington, D.C.